Retorting is heating of low acid foods prone to microbial spoilage in hermetically sealed containers to extend their shelf life. 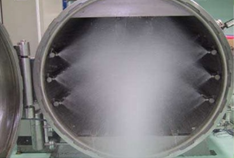 The goal of retort processing is to obtain commercial sterilization by application of heat. Foods can be sterilized in rigid containers like glass, metal cans and plastic or flexible retort pouches. Metal cans and glass jars are widely used for retort processes, because of their high mechanical strength, thermal stability, resistance to pressure, and excellent barrier properties. 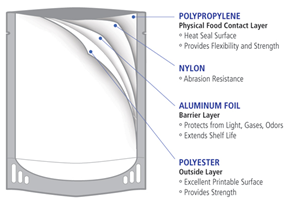 A typical retort-able plastic container is made of an oxygen barrier layer such as ethylene vinyl chloride (EVOH) or polyvinylidene chloride (PVdC) sandwiched between two polypropylene layers.Flexible retort-able pouches are laminated structures that must provide excellent barrier properties for long shelf life, seal integrity, puncture resistance and must withstand rigorous thermal processing. 1. A visual assessment is done by qualified, experienced personnel to make sure that the pouch is correctly formed and that there are no channels through the seals. 2. Seal strength is measured (usually mechanically) and must comply with specification. 3. Bond strength of the various laminate layers is assessed by physically tearing the layers apart. 4. Burst strength of the pouch is measured by filling it and then subjecting it to a specific force. 5. 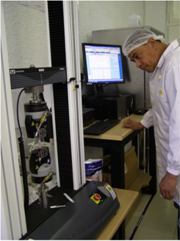 Oxygen permeability and water transmission rates are measured on bag samples before and after processing. 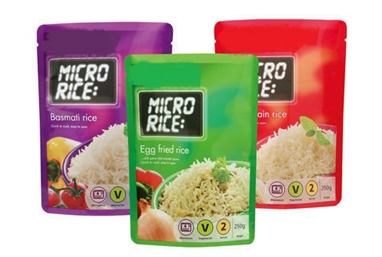 Retort technology can be applied to process ready meals, sauces, marinades, vegetables curry, soups, and rice.